LESTER HOLT, anchor (Amman, Jordan): Also in Ohio earlier today, a shooting at a college fraternity house left one student dead and 11 people injured, six of them students. It happened in Youngstown , Ohio , near the campus of Youngstown State University . Police say a party was going on when the shooting took place. The dead student was 25 years old. Police say the victims were shot by two men who were involved in a dispute at that party. They are trying to identify the shooters. 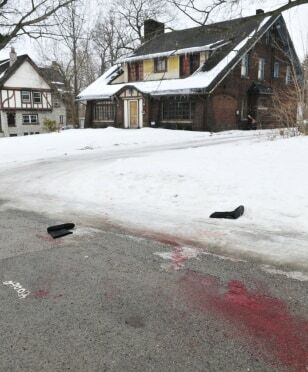 What appears to be blood stains on the street near the scene of an early morning shooting at a house just north of the Youngstown State University campus that left student Jamail E. Johnson, 25 of Youngstown, dead and 11 injured, In Youngstown, Ohio on Sunday.